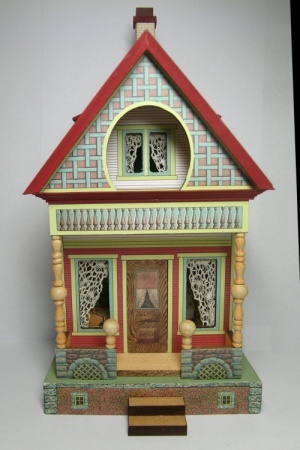 WE ARE REPEATING THIS SERIES OF 1/4 SCALE BLISS HOUSES BY REQUEST. 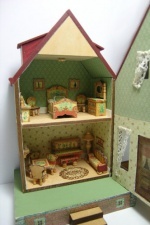 I love those antique Bliss dollhouses. I have had kits for some very tiny renditions in my line for quite a while. 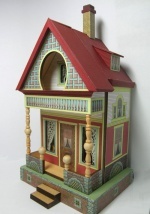 But I recently acquired an original bliss keyhole house. This inspired and enabled me to make a simply fabulous quarter scale reproduction, and I'm sharing it with you. 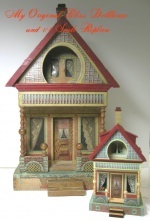 This darling house is constructed of wood, and is then covered with reproductions of the original artwork found on my antique. This is not home printed artwork, but commercially printed on acid free 28 pound paper with archival ink so that your project will last for many generations to come. The simple two room house opens at the front, with a hinged front facade. The lower floor is the parlor, and upper floor is the bedroom. Even tho it's not authentic to do so, I have added a light in each of the two rooms, which is powered by a coin battery and on off switch which are both hidden under the hollow base. No cords, or transformers needed, this is a "self contained" project! The house turned out so divine that I had to do my best to reproduce the bliss furniture that would have originally been offered at the time. The furniture was very simple, and a bit clunky, with fun and funky lines and simply gorgeous graphic illustrations. The 9 piece parlor set is commonly called the ABC set, as each of the pieces features different letters of the alphabet. Parlor includes four chairs, table, piano/bench, floor lamp and sofa. Wall shelf, and home sweet home framed art are also included. They are not original to the bliss furniture sets, but we all need accessories, and they certainly do look cute!! The bedroom features a lovely bed, dresser, two chairs, and a wash stand. Again, bright colors, simple lines and pretty graphics are used for this furniture. House stands 7 7/8" tall, and is 4" wide. All materials and artwork are included. Students will provide acrylic paints, glue, scissors, tweezers, and assorted paint brushes. An exact supply list with necessary paint colors will be sent prior to class. An extensive online tutorial will be provided with lots of great photos and written instructions.. Please email with any questions, and see below for lots more photos. KIT WILL SHIP AT THE END OF MAY.